Your spleen is a fist-shaped, 4” long purplish organ located in the upper part of the abdomen, to the left of the stomach. It is well-protected by the rib cage and can’t be easily felt, unless it is abnormally enlarged. Part of the lymphatic system, the spleen plays a vital role in immune response and waste removal. We can live without the spleen, but its absence predisposes to certain infections, such as influenza, pneumonia and meningitis, as it is a center of activity of the reticuloendothelial system. Here, it synthesizes antibodies and fights infections through both an active humoral and cell-mediated immune response. Enlargement of the spleen can occur with certain infections and in some cancers, such as leukemia. The spleen acts as a mechanical filter for aging red blood cells, recycling stores of iron contained in these cells, serving as a reservoir for blood for emergency use during times of trauma and shock. Dietary spleen is a great blood builder and in Traditional Chinese Medicine, enhancing spleen energy is very positive for aging and longevity. The spleen is also a storage site for white blood cells (lymphocytes) and platelets. Food has a profound influence on health, and spleen is truly a superfood. Our 500 mg capsules are a key supplement for immune health and for healthy blood. Beef spleen is a traditional food that is used in many cuisines around the world, rich in protein, iron and healthy fats. Our freeze-dried spleen from grass-fed New Zealand cattle provides the benefits of this healing food, containing all of the known nutrients that naturally occur in a healthy spleen, including minerals, peptides and special nutritional factors. Radioisotope labeling studies in animals have shown that when eaten, organs and glands selectively travel to the corresponding organs and glands in high concentrations. This research, done at the University of Scotland in Edinburgh, lends credence to the ancient practice of eating animal organs to help ensure health in one’s corresponding organs, and helps explain why eating organ meats plays such a central health-enhancing role in traditional cultures. Our organ and gland supplements serve to complement the diet by providing small but significant amounts of these special foods not available otherwise. About an ounce of fresh raw glands are freeze-dried into each six 500-milligram capsules. 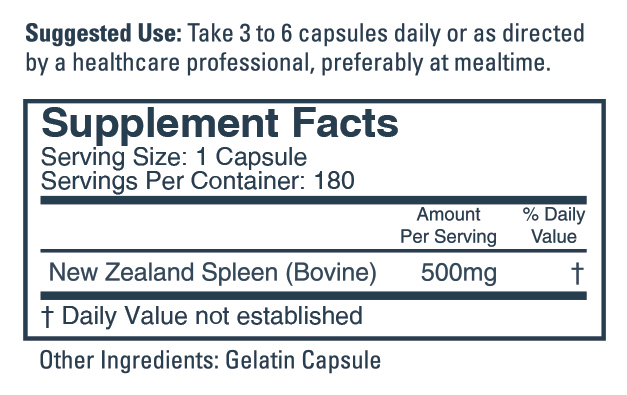 The suggested dose for spleen is anywhere from one to six capsules daily. I was referred to this product for my canine (even though it is labeled for human use). My boy has been through a lot but it was showing nodules on his spleen 09/2017. Last ultrasound 03/18 showed no nodes. Whether this is due to the glandular or not (I believe it is), I now use several of these products for him because "like heals like". Love these products!